The Koolair Group, comprises the KOOLAIR and SAFEAIR companies and specializes in the manufacture of air diffusion and distribution products. The group is renowned for the design, development and innovation of its equipment, which is tested at an in-house R&D and Innovation laboratory. The Group’s production facilities in Móstoles (province of Madrid) are highly automated and equipped with robotic systems. KOOLAIR, S.L., has been operating in Spain and in international markets since its inception in 1968. The firm is considered as the leader in its industry and focuses its work on air distribution products, ranging from grilles and diffusers to sophisticated high-tech products (eg, constant and variable air volume units, variable geometry diffusers, displacement diffusers, silencers and filtration ceilings) and air-water systems (eg, chilled beams and inducers), among others. Its products are most commonly sold in Europe and other countries in the Mediterranean area and South America. Koolair is particularly known for its selection software for “Komfortair 3D” air diffusion components, “Komfortair-water” chilled beams and dynamic quick-selection tables, as well as the versatility of its products in adapting to the requirements of each application. INFORMA D&B recently recognized Koolair, S.L., as one of the main Spanish companies of the year. SAFEAIR, S.L., was founded in January 2001 and manufactures fire protection equipment, such as round and square fire dampers, in addition to smoke removal dampers. The company has been certified as ISO 9001-compliant since 2002. 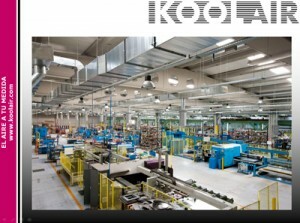 To discover more, you are invited to watch a virtual tour of Koolair S.L. Details provided by individuals will be held in a file that is maintained by KOOLAIR, S.L., at the address: C/ URANO, 26 - POLÍGONO INDUSTRIAL Nº2 “LA FUENSANTA”, 28936 MÓSTOLES (MADRID), as a means of responding to their request for contact by whatever means of contact is provided. The legal basis that legitimises the handling of data is their express consent. Details will be kept until the request is satisfactorily completed. Individuals can withdraw their consent and exercise their rights of access, rectification, cancellation/deletion, opposition, limitation and transfer by contacting the address indicated and providing a copy of their ID card or equivalent document. Furthermore, if they believe their protection of personal data rights have been violated, they can file a claim with the Spanish Data Protection Agency (www.agpd.es). We use our own cookies and those of third-parties to improve our services and facilitate navigation. Continuing to access the site will be considered as an acceptance of their use.